A nice game to take along for the kids. 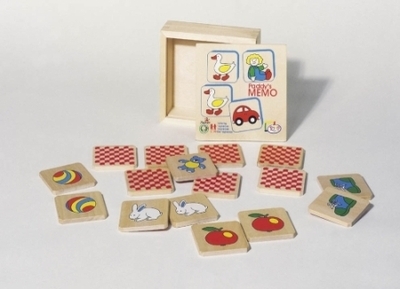 This wooden mini memo has 16 wooden tiles and comes in a wooden box with a sliding lid. The tiles measure 2" x 2" and the box is 4.6" x 4.6" x 1.5". The tiles depict rabbits, dolls, balls, apples, cars, bears, ducks, and shoes. Recommended for three and up.